If we open up the definition of ethnography beyond text and print, then we can start to envision a media-enriched, performative, and collaborative space for ethnographers to convey what they have encountered, experienced, and postulated. Utilizing the affordances of digital media, ethnographic knowledge can be stored, expressed, and shared in ways beyond a single medium, direction, and user. 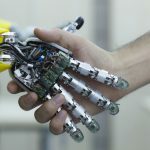 In what follows, I will outline a few computational practices, platforms, and projects to illustrate these points. Ethnographers of various disciplinary backgrounds including ethnomusicology and anthropology have elaborated on the value of extending their intellectual scrutiny to include the sensoria. In particular, Paul Stoller claims that sensorial narratives in ethnography found in earlier writing, for instance by Malinowski, have been overshadowed in the analytical prose in problem-oriented ethnography. He suggests a close engagement with the senses of taste, smell, hearing, and sight – a privileged mode of inquiry in European societies – to make our ethnographic accounts “more faithful to the realities of the field.” There is, of course, a longstanding tradition of ethnographic films and field recordings within anthropology. Practitioners of film and sound ethnography believe in the value in transmitting content in a medium that is most proximate to the source of knowledge, and is otherwise inexplicable in a different medium. Steven Feld, for instance, coined the term acoustemology, an acoustic epistemology, to express a way of knowing and navigating in one’s physical and social environment through sound. A successful example of a multimedated field-informed project is the Hi-Fi Collection, a place-based multimedia story about Los Angeles’ Historic Filipinotown (hence “Hi Fi”). Divided into ten chapters, the collection contains a series of narratives as text, audio, and video, for instance about the historical migration of Filipino immigrants across the greater Los Angeles metropolitan area. Users may explore the collection by reading the narratives displayed alongside indications of where and when the event took place, or browse it by playing with the map or the timeline above it. 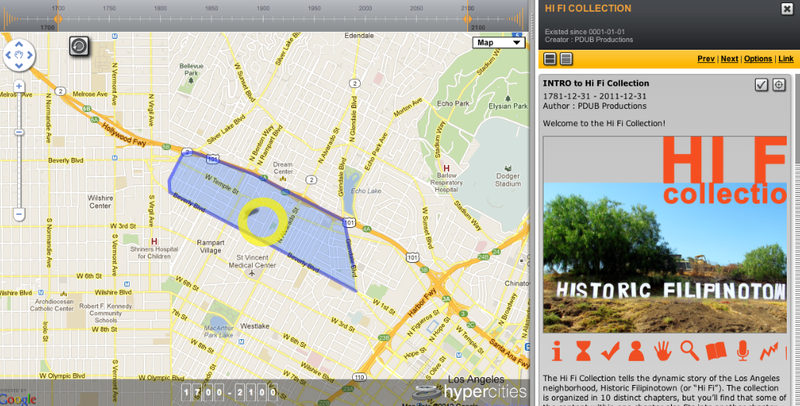 The Hi Fi Collection lives within Hypercities, a mapping platform developed by faculty and staff technologists at UCLA for exploring city spaces through historical map layers and other associated interactive hypermedia. The content and research that drives the development of Hi-Fi Collection is a result of collaborative efforts by UCLA faculty Jan Reiff, students, youth participants in the PDUB Productions program, and other partner community groups and organizers such as Public Matters and Pilipino Workers Center. My most satisfying experience of browsing in Hypercities has been guided by a spatial curiosity. That is, place first, and then contextual information about the place. While the Hypercities platform can present content of various types, the visual framing of the navigation window gives more emphasis on the geographic (and to a lesser extent, the temporal ) [Figure 2] over other organizational schemes such as narrative or time. This interface design, in my opinion, suits narratives driven by geography, but can relegate textual and audio-visual content to a secondary position in other kinds of narratives. If ethnography is an investigation of how a group of people sense and know their world, then how do we express that while staying true to its structure of epistemology? A simple web map (like Google Maps), with its bird’s eye view, may shed light the relationship between places, but it may not illuminate how people experience and navigate in that space. A timeline moves in a linear fashion, either forward or backward in time; but this linearity doesn’t convey people’s sense of temporality and relationship to the past, present, and future. What I’m provoking is a content-form synergy that articulates ethnographic knowledge in a structure organized by an emic sensibility or knowledge system. While digital media may not be vernacular to the community of interest, but they can be shaped to reflect a vernacular sensibility or epistemology. Digital content systems can be programmed to scaffold a multisensory interaction, meaning the ability to exhibit information in a sequence, or in relation to other media objects in meaningful ways. Designing an algorithm that predetermines the scenarios in which a user interacts with content would shape the delivery of an analysis or argument. It would also enable nonlinear argumentation and narratizing. Tara McPherson has theorized database’s capacity of re-presenting knowledge beyond the “subordination to a linear spine, [that] often meaning that certain trajectories or trains of thought get pared off or eliminated”. Vectors is a web-based peer-reviewed journal that is developed by USC faculty and staff, and affiliated with the Open Humanities Press. The technologist staff works with academic content providers to design multimedia systems to publish materials in modalities that engage with the analytical, affective, sensorial, experiential, and multidirectional. Vectors has published a few ethnographic projects. In a piece entitled “Digital Dynamics Across Cultures,” Kim Christen explores alternative methods to present digital photographs and videos that she created in collaboration with the Warumungu men and women during her field research in Australia. 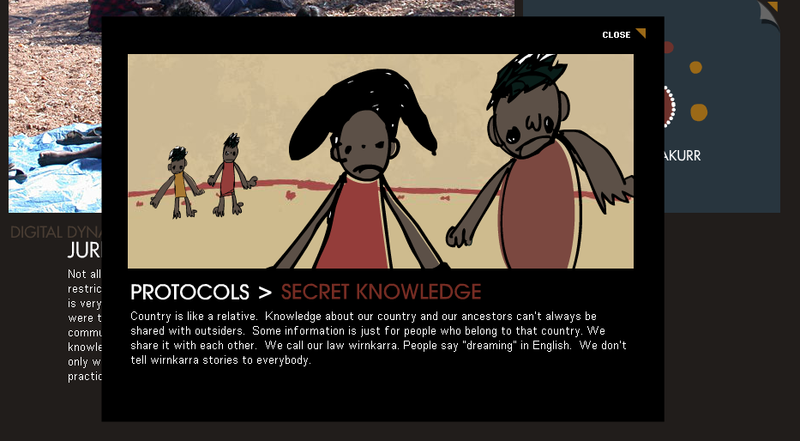 Working with Chris Cooney, staff designer from Vectors, Christen devised a dynamic audio-visual system that follows and displays the dynamic logic of knowledge transmission that is faithful to the kinship and ancestral networks of the Warumungu people [Figure 3]. 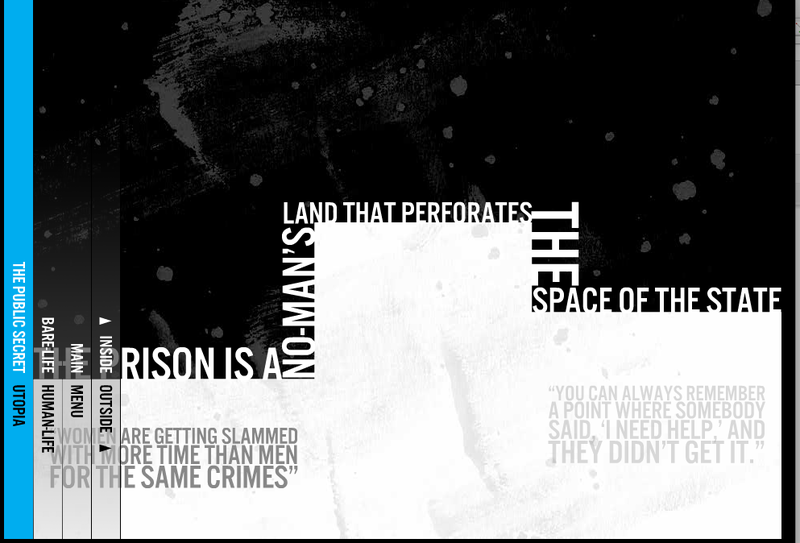 Her ethnographic website presents and exemplifies an “internal logic [that] challenges conventional Western notions of the ‘freedom’ of information and knowledge sharing’ as well as legal demands for single-authored, ‘innovative,’ original works as the benchmark for intellectual property definitions.” This work exemplifies the strengths and flexibility of digital multimedia media as a platform of scholarly ethnographic publication. Through an engagement with multiple senses, the unique combination of ethnographic content and form reflects the worldview and epistemological specificity of the group of people that she interacted with during fieldwork. 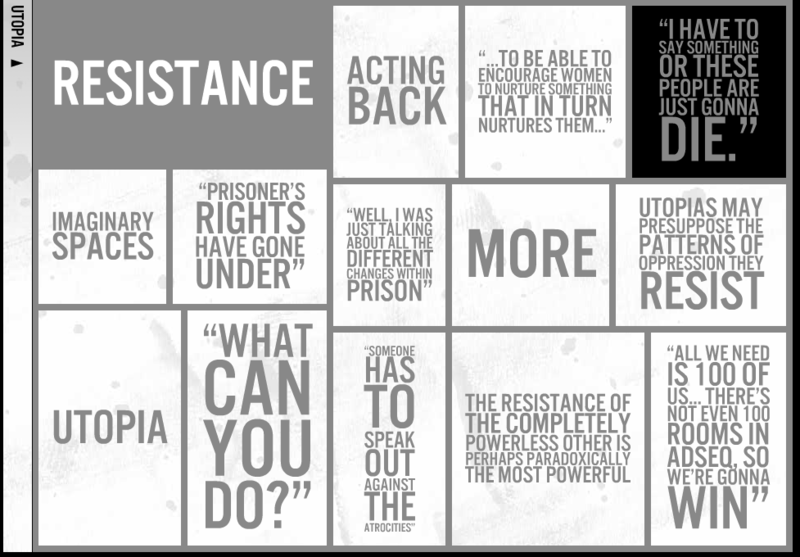 One this site, the user can play back location recordings of conversations of the inmates, putting these women’s voices in dialog with academic texts about the prison industrial complex and theories of utopia, resistance, etc [Figure 5]. Juxtaposing informants’ voices with texts by academicians such as Angela Davis and Frederic Jameson validates the experience and knowledge of these women. This epistemological parallel destabilizes the social distinction between an imprisoned and a free person, deconstructing notions of deviance in the society. 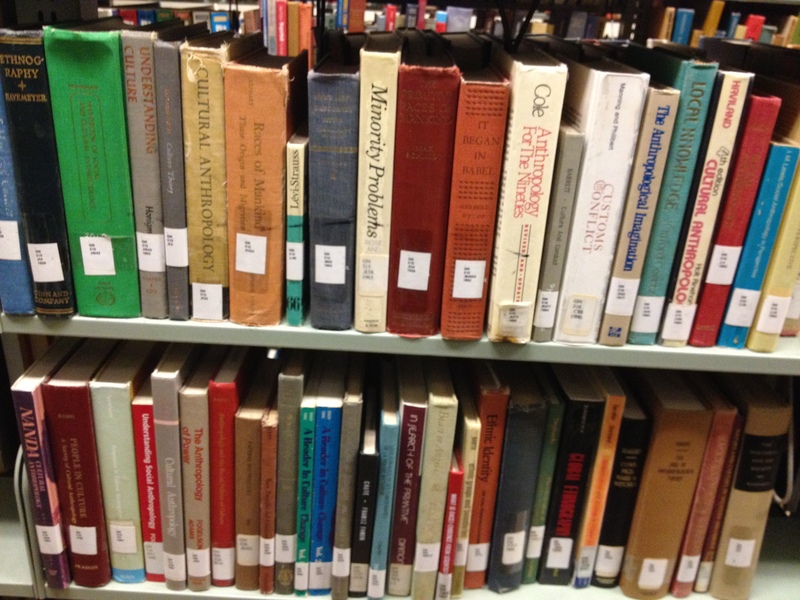 The intimate relationship between ethnography and archive has been established for a while. With the recent development in database design, ethnographic archives have been built to meet the cultural sensitivities of field materials and preservation needs of the community and ethnographer. A significant advancement in ethnographic archive is the ability to present raw data and interpretive content at once. This multi-tier display mode – of both primary and secondary sources – invites the users to engage with content in exploratory and argumentative pathways, respectively. 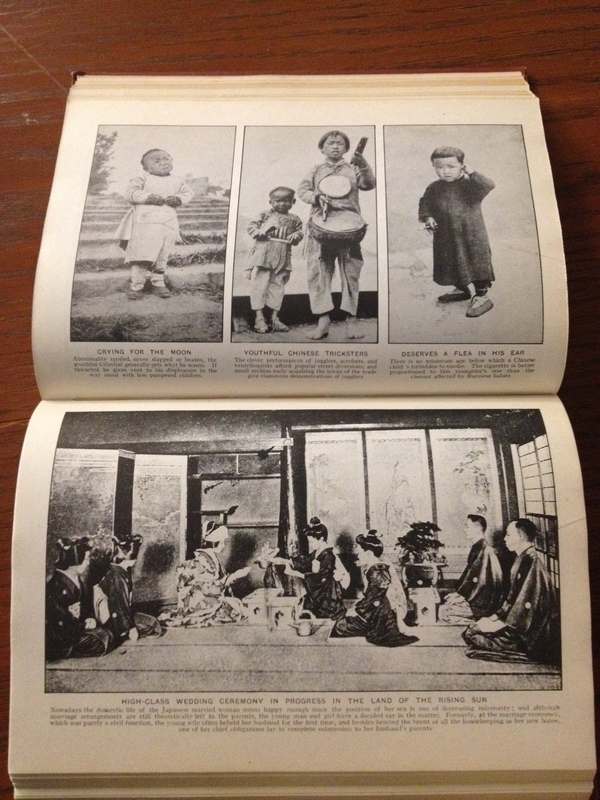 Making available primary source materials encourages the users to formulate their own interpretive lens on the materials, thus making the “reading” experience more active and participatory. Further, it expands the ethnographic aim of providing a thick description by ushering in set of media-enriched field documentation. In this way, the multi-tier digital archive engenders among the users an individual experience of field materials as they are reanimated through a pathway chosen by the users themselves. In other words, the multipath structure of the archive, and the optional engagement with either the media objects or the annotations heightens the sense of agency in the viewing experience. 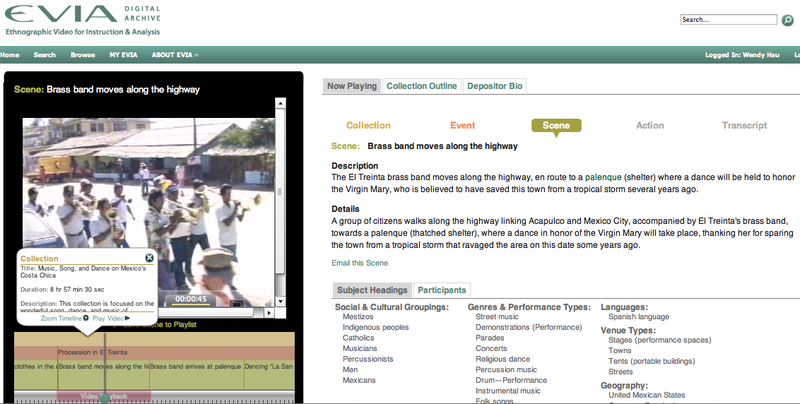 The EVIA (the Ethnographic Video for Instruction and Analysis) Project is a great example of a multi-tier digital archive that serves the three-prong function of preservation, annotation, and publication. The EVIA project staff and contributors work to further their ambitious goal of creating a “support system and a suite of software tools for video annotation, online collection searching, controlled vocabulary and thesaurus maintenance, peer review, and technical metadata collection.” The site’s content is clustered as video collections, each created and organized by an ethnographer with particular subject speciality. A collection consists of a series of event-based videos with detailed annotations, along with a long-form narrative that encapsulates the scope of the collection and contextualizes it in social, historical, and geographical terms. Within a single collection, users could freely skip across events or scenes; or alternatively, users may browse content at the pre-curated, collection level, starting with the collection-level background narrative, then working their way down to each of the video events that are further subdivided into scenes. The media-enriched interface enables the users to read the annotations and simultaneously use the fine-grained playback functions for closely examine the recording [Figure 6]. In an exploratory mode, users can experience the site using a query-based search function to explore video based on metadata selection metadata selection organized by geography and style of performance. This feature makes possible the comparison of field recordings across geographical and stylistic categories. 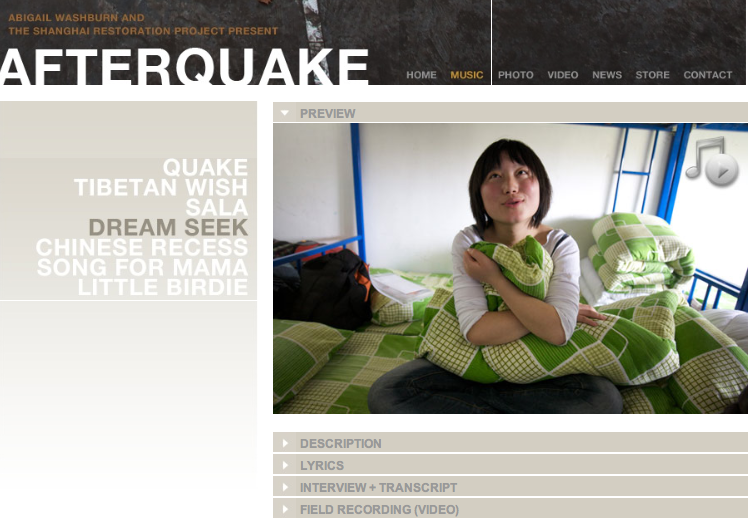 A brilliant example of a non-academic ethnographic archive is Afterquake, a multimedia website that documents the process of field-based recording and collaboration between American artists David Liang and Abigail Washburn and the children in areas affected by the 2008 Sichuan Earthquake in China. Liang and Washburn traveled to record the music and ambient sounds of sites of earthquake destruction in Wenchuan County in the Sichuan Province, a year after the earthquake struck. What they found were sounds of post-disaster mourning, community reconstruction of homes, and reflections of disaster aftermath among youth who shared them in the form of songs. Liang and Washburn remixed these field voices, narratives, and sounds into tracks that were then sold to raise funds toward those were in need. Most of the site content is organized into paths based in individual music track. While listening to the track, the user may read about the production context of the song, and browse the credits and interview transcripts of the local participants involved in the making of each of the tracks in both Chinese and English [Figure 7]. These supplementary materials serve as raw data that could enrich the interpretation of the song (the interpretive, secondary-source content). Making available primary source materials also encourages the users to not only imagine the process of creation. It also enables the users to form an individual relationship to these raw materials, while inviting them to join the remix of these geographically and temporally situated cultural artifacts. Unlike its analog counterpart, digital archives allow ethnographers and users to continually engage with field objects rendering the notion of archive unstable. The meaning of field documents including field notes, recordings, transcripts, photos, can continue to morph and form new relationships with other objects in a digital environment as new content and metadata is added to the collection. This dynamicism stands in contrast with conventional collections — in analog form such as a book or a journal article in print — that are fixed and museumized. The reanimation of field objects can prevent the rarification of culture, a risk that we take while creating any ethnographic representations [Figure 8]. 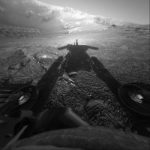 Jenna Burrell evoked the idea of“performing the fieldwork experience for audiences – raw data, transparency, and visuals” in her recent post. I think that this metaphor of performance can also be applied to the ethnographic process. We can reconsider the ethnographer as a performer along the fieldwork-ethnography continuum. If field research is a snapshot of a lived and alive culture, then the ethnographic production is a representation of a part of this lived culture at a specific time and place. Most researchers (I included) revisit field materials to review, re-evaluate, and (re)-produce analysis. Oftentimes, this process of re-view and re-analysis leads to further field interactions and documentation, thus forming a cyclical process from field interaction, collection, analysis, and then back to interaction. Field documentation accumulates as researchers extend their interaction in the field. It may be useful to think about this accumulation in an interactive, performative way — as a repertoire, not as an archive (drawing on Diana Taylor’s theory). If the shape of our knowledge production allows the space for flux, we could better articulate the changing nature of the source of our knowledge. In short, a digital archive can be closer to life because it is akin to the performative practice of building a repertoire from which agents (informants and ethnographers alike) draw scripts, meanings, and inspirations. Social media including blogs, Twitter, and Instagram have transformed how ethnographers communicated their research. Blogging ethnographers have proliferated over the last few years. The use of Instagram to create flash photo field notes is becoming more of a norm, thanks to Tricia Wang who articulated convincingly the ethics and benefits of an open ethnography. After my last field trip to Taipei, I experimented with Storify to aggregate and organize field content that I produced across a number of social media platforms including Twitter, Instagram, Facebook, Youtube, and Tumblr into a coherent narrative. The digital capacity for instant documentation and systemic content storage and organization makes digital social media extremely appealing for fieldwork. While social media ostensibly makes a promising gesture toward open information and access, the question of to whom this content is open is still contingent upon the communities and their access to and experience of media. As an example, in my research, I hung out with a group of elders, musicians, and other members of the homeless, impoverished, and disabled underclass in the Mengjia (also known as Mongka) district in Taipei. 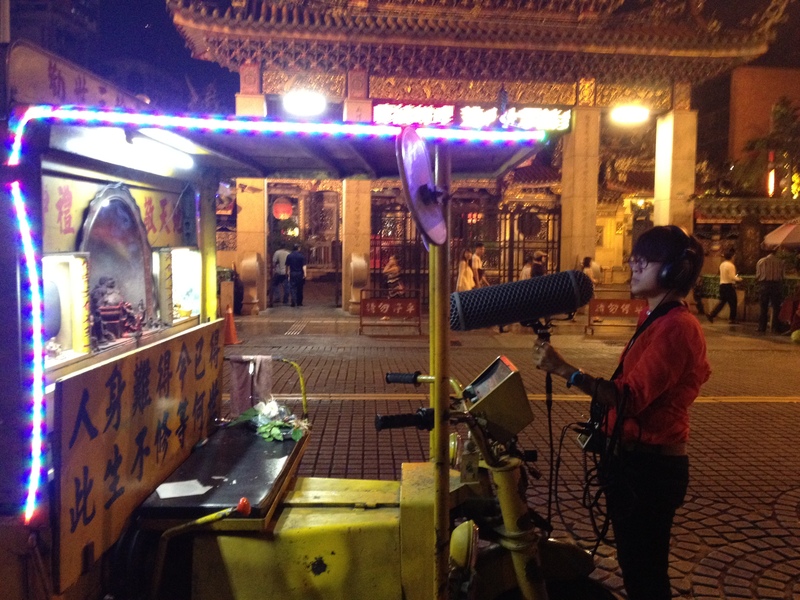 I collected field recordings of some of the ad-hoc street performances by the nakashi musicians. I Instagrammed my observations of performance and audience interactions. My documentation practices informed peers of my networks about my field observations as these documents instigated a deepened conversation about what I observed. But none of the members of the community that I studied, it seemed, have a life embedded in these digital social platforms. Increasing access is difficult or impossible to realize depending on how embedded of your engaged community is in the (same) digital world(s). Further, openness could mean different things for various stakeholders in an ethnographic situation. While I would like to communicate my findings to the world, my informants may not be interested in and could be obversed to my sharing of information about them with the world. Collaboration is an ideal, but it doesn’t always equal openness. Transparency of research motivation and sharing of research results and products with the engaged community is a good thing. But an open access to information is not necessarily ethical in all situations. In light of the ethics and politics of access, I will talk about digital content management system as a possible approach to democratizing access and authorship in ethnographic knowledge production. A prominent feature of digital content systems is the ability to allow multiple authors on a single platform. The multi-author feature facilitates and organizes the sounding of multiple voices. 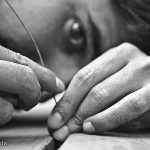 This has particular implications for the politics around authorship and access in light of colonial practices associated with the history of ethnography – probing at the problematic western/northern-hemispheric/first-world representations of non-western/southern-hemispheric/third world experiences. After her Vectors-based project, Christen Kim continued her work in developing technology and information design to empower indigenous communities. Her most recent project, Mukurtu (Mook-oo-too) is a free and open-source “community archive platform” built for indigenous communities to preserve, manage, and share their own heritage content. The name “mukurtu” comes from the Warumungu community that she has worked with; it means “dilly bag.” Apparently, the elders of this Warumunga community chose the name for the system because they thought of it as a “safe keeping place.” Mukurtu comes with a set of fine-grained levels of access affording the users to manage the flow of their information based on protocols that reflect the social relations and values such as intellectual property rights of the group. I’m particularly excited about Mukurtu Mobile, an app that allows one to document and collect stories in the field, and then upload and manage them within the archive once connected to the network. The offline-online continuity fits the dynamic, on-the-go spatial demands of fieldwork, and anticipates unexpected needs for documentation. To conclude, I will tell you a little of dream that I have. After I came back from Taipei, I became frustrated by my inability to contact the members of the Mongka community that I befriended in Taipei. In particular, my main informant, a grandma-aged woman who took me in as her “god-daughter,” refused to give me her address and told me that she’s sick. I’m not sure what that meant, but I could tell that she, along with others in the group, prefers face-to-face interactions over other mediated forms of contact. If I have the means, I would like to go back to Mengjia to set up a mobile karaoke stand / Internet café [like the “Exhortation Tricycle”, Figure 9] for this transient but socially intact community. I will make available a few computers and help those in the community with an interest in digital communication to get set up in digital platforms of their choice to document their day-to-day, special events, and memories. I will also introduce Mukurtu to them to they can think about access and come up with protocols of information that suit their needs. Maybe these documents will engender a space for a collective reflection as they face the silencing effects of gentrification and urban renewal. Maybe the creation of these documents will give them a sense of control over their changing environment. Maybe they can then create a subset of the exhibition-ready documents to rally for rights while they combat evictions. See Stoller, Paul. 2011. The Taste of Ethnographic Things. Philadelphia, PA: University of Pennsylvania Press, pp. 8-9. Browse: Christen, Kim and Chris Cooney. 2006. “Digital Dynamics Across Cultures,”Vectors. Fall, Volume 2, Issue 1, Ephemera. http://vectors.usc.edu/projects/index.php?project=67 (accessed January 22, 2011). Browse: Daniel, Sharon and Erik Loyer. 2006. “Public Secrets,” Vectors. Winter, Volume 2, Issue 2, Perception. http://vectors.usc.edu/projects/index.php?project=57 (accessed July 9, 2013). Reblogged this on Swift, like Shadows. It is intimidating to experiment with methods outside of disciplinary conventions. I was lucky to have gone through a series of fellowships first at the Scholars’ Lab and subsequently at Occidental’s Center for Digital Learning & Research. But I would say that scholars with an interest in digital ethnography can get started by engaging in the conversations online. I’ve learned a lot of methods and tricks by hanging out on Twitter and follow folks like Tricia Wang (@triciawang), Jeanna Burrell (@jeannaburrell), Kim Christen (@mukurtu), Tara McPherson (@tmcphers). There are also networks like the EMAC (Ethnography Media Arts Culture) network (@EMACnetwork) and Ethnography Matters (@ethnomatters) that bring together people who share their process and methods of engaging in innovative practices of ethnography. – Would you like to share the process of your work as you’re collecting data? – Is place an important organizing principle? – What media documents do you collect? If you would like to share the process of your work as you’re collecting data, consider an open ethnography model by doing things like writing live field notes. Tricia posted about this a little while back. I experimented with a version of that by using Instgram, Twitter, and Storify. If you were curious about new field work tools and techniques, definitely check out Ethnography Matters series on “Tools we use”. Then there’s the bread and butter of keeping a blog and participating on social media platforms like Facebook and Twitter to share process, findings, and results as you research. This allows for a healthy dosage of interactions with your research associates and scholars of interest. Do ask yourself whether place an important organizing principle in your work. Also think about whether you are interested in the physicality of space or the people experience of space. These considerations will help you think the kind of place-based information most relevant to your project. For a more emic perspective on space, consider integrating (map) drawing into your engagement with research associates. If you’re looking to capture more of an etic perspective on space and place, collecting lat-long information (using a GPS or a smart phone) or balloon mapping may be useful. I’d be happy to share what I know regarding GIS ethnographic processes. Lastly, think about the kind of documents (media, recordings, etc) that you’re already collecting in your work and what other media types are you missing in your project. You could systemize your collecting process to see if there are interesting or note-worth patterns that are worth sharing. As you acucumulate media objects and documents, you can start to imagine how you would organize them either for yourself or for a public or external audience. This is the point at which you may think about a content management system. Do you want to find an existing publishing platform and then just use it with some minor tweaks? Or would you like to build your own or heavily modify something that’s out there? Going with the existing publishing platform also means connecting with a community of users. Who will your audience be? Academic or the public? There are many considerations here. I’m still working this out in my own work. I will share more process when I get to a productive point. This is a quick answer to your question. At some point, I should write another post to elaborate on the how-to-get-started question. Thanks for reading and responding!